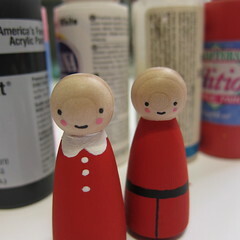 This week’s ornaments are an adorable little pair that bring back memories of some of my childhood ornaments. 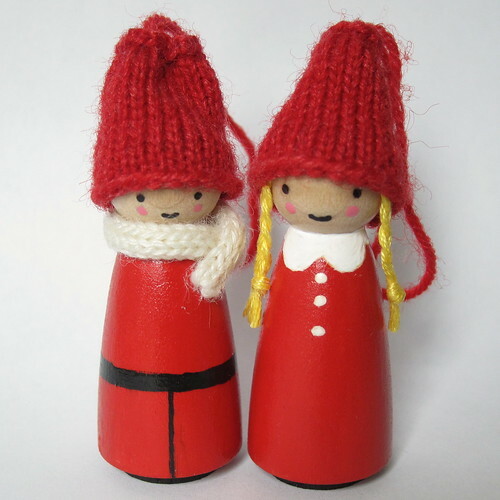 Growing up my brother, sister and I each had something similar that I think my grandparents got them for us in Sweden. 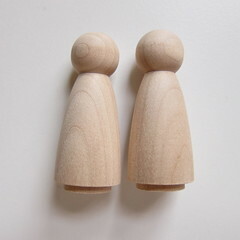 Then this last year I bought each of my nephews one of their own while I was in Stockholm. 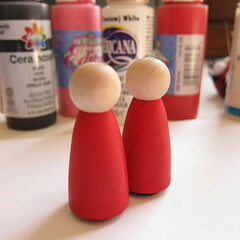 When I saw the wooden doll pins at Joanns the other day, I knew I wanted to try making my own version. 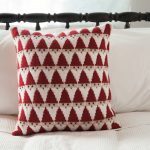 All it takes to make these little guys up is a steady hand with a paintbrush and a little bit of easy knitting. 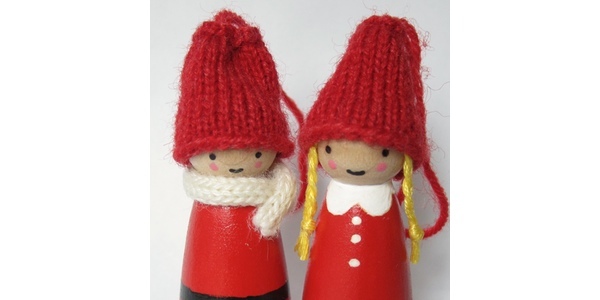 If you aren’t a knitter you can make the hat and scarf from felt instead (though knit it more traditional). 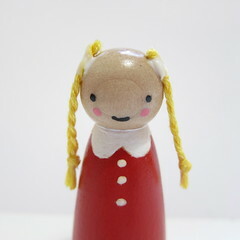 The girl can easily be personalized for any little girls in your life by changing the color of her braids. I enjoyed making them so much, I wish I had more nieces and nephews. 1. If your doll has a base paint it black. Then paint the body red. Be carful not to get red on the face and make sure to get the underside. 2. Paint on the details. For the boy, add a belt and a pant leg split in black. For the girl, add a white peter pan collar and buttons. With the red, cast on 22 stitches. Either work in the round by knitting each row or flat in stockinette until 1″ long. Bind off leaving a 10″ tail. If knit flat sew into a tube. Use the bind off tail to do a row of straight stitches just under the bind off row. Pull tight. 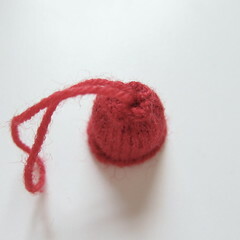 Put the tail into the middle of the hat and pull up through the center of where you just tightened. Put the tail back into the center again creating a hanging loop at the top of the hat. Tie off inside the hat. Weave in cast on tail. Make two hats. You can also make a hat out of felt by cutting a 1 3/4″ x 1″ rectangle. 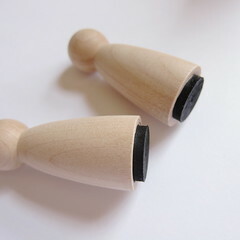 Sew into a tube that is 1″ high. With the white, cast on 4 stitches. Work an i-cord for 2 1/2 inches. Bind off. Weave in ends. You can also use a piece of white felt or ribbon as a scarf. 4. 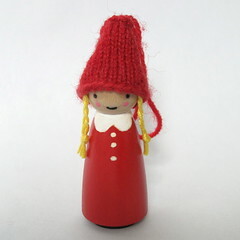 Put the hat on the doll where you will want it and lightly draw on the face with a pencil. Remove hat and paint on face details. I found the tip of my knitting needle or a toothpick works perfect for this. Let dry. 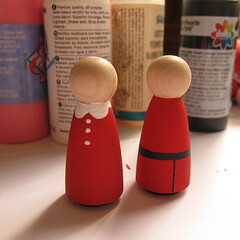 Give the whole doll a coat or two of polyurethane and let dry completely. 5. 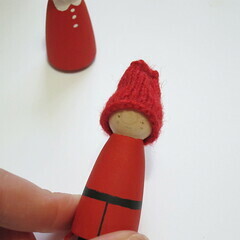 To finish the boy, glue the hat in place. Glue the scarf around the neck. I find a small brush is handy to clean up any excess glue. 6. 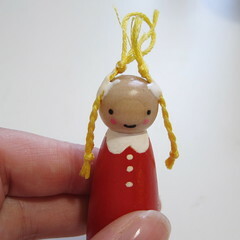 To finish the girl, take three pieces of embroidery floss and tie together with a knot. Braid for about 1 inch. Tie a knot at the end. I like to put a little glue on the knot at the end so it won’t come undone over time. 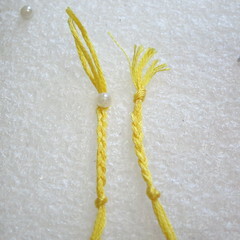 Make two braids. Glue the braids to either side of the head just below the first knot. Make sure to get glue under and over the braid. Let dry. Cut the knots off the top of the head. Glue hat on over the top of the braids. 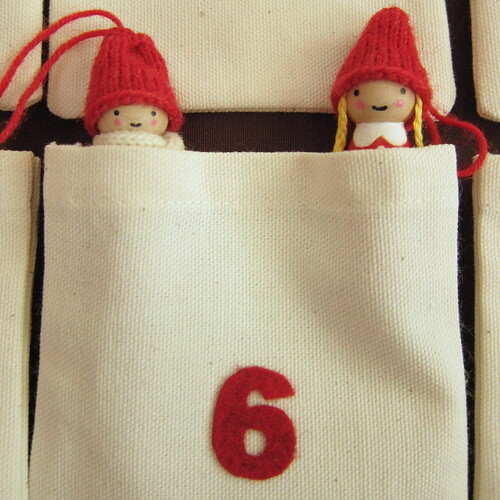 You can fit a whole family of them in one day of the pocket advent calendar. 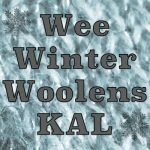 7 years ago by Kat in Advent Calendar Project , Christmas , Craft Projects , Crafts , Holiday , Knitting , Knitting Projects , Needlecraft , Projects | You can follow any responses to this entry through the RSS feed. You can leave a response, or trackback from your own site. What size needle and yarn? 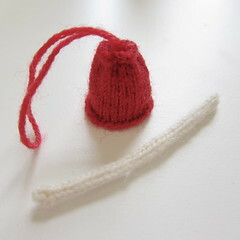 If you look in the supply list you’ll see it says sock weight yarn and size 00 needles (or size needed to get gauge. I don’t knit can you crochet these? I’m sure you could, but since I don’t really do much crochet I couldn’t tell you exactly how to do them. 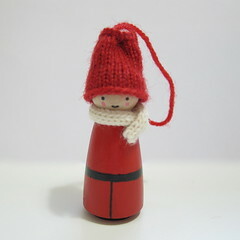 The hat is just a simple cone and other than that you just need a small scarf. Where might we find the other projects and the calendar. These are adorable. For four years I did this advent calendar project where I shared 24 DIY ornaments. 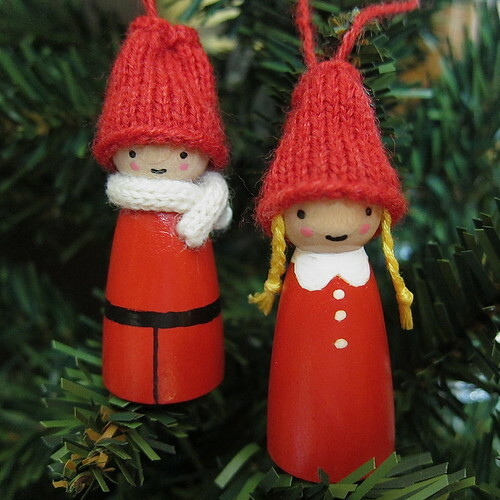 You can find links to the ornaments from 2012, 2013, 2014, and 2015 at the links. We made this pocket calendar to put them in.